We have spoken about the benefits of regular moisturizing time and again, but it is equally important to find the right kind of moisturizing lotion. I have used a variety of lotions, but that does not really keep me from looking for something that would suit my skin perfectly. I have a normal skin type but it tends to get a little dry with change is seasons. The biggest mistake most of us make is not moisturizing our skin in the summers. Moisturizing is a vital part of skin care, one should never ignore it! You can always use a mild but an efficient moisturizer in the summers, but it’s a must. My today’s review is on this really incredible body lotion which I bought very randomly and the main reason was obviously the fragrance. This one is called the Boro plus Total Results Moisturizing Lotion. 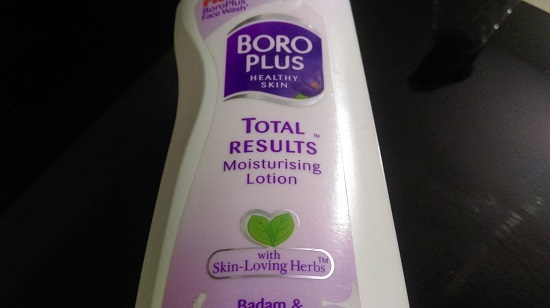 Boro plus is a name that is very known to us …the body lotion on the other hand is a recent venture. Like I said I was driven to it because of its fragrance which is hands down one of the best I have smelled! And also it is really long lasting, both the fragrance and the affect. I am going to tell you lot’s more about this lotion in just a bit! I am also going to mention some of my all-time favorite body lotions that I have used in the past. 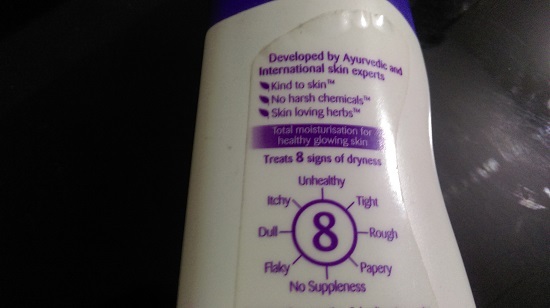 Our new product Boro plus Total Results Moisturizing Lotion fights 8 signs of dry skin. It has skin loving ingredients like milk cream, almonds, saffron extracts which help to give skin nourishment and keep it moisturized to last long hours. Ideal for winters, this Boroplus Total Results Moisturising Lotion is enriched with the natural goodness of nourishing almonds and moisturizing milk cream. It penetrates deep into the skin, maintains moisture balance, making the skin soft and healthy. It has no harsh chemicals and includes skin loving ingredients which causes no irritation on the skin. It treats signs of dry skin including unhealthy, rough, tight, itchy, dull and papery skin. 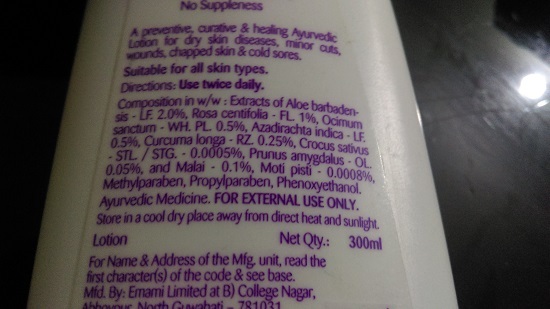 It is an ayurvedic lotion for dry skin, minor cuts wounds, skin damage, chapped skin and cold sores. The best way of applying any body lotion is to apply it when your body is a little wet. So right after your bath, take the required amount of lotion and apply it all over your body, massaging it well. The left over water on your body makes it easy for the moisturizer to penetrate inside your skin and also locks the water .Best for skin hydration! For best results apply it twice a day. 2 years or 24 months from the date on manufacturing. It is most definitely suitable for all skin types. It’s not very heavy on the skin and does not make the skin too oily. 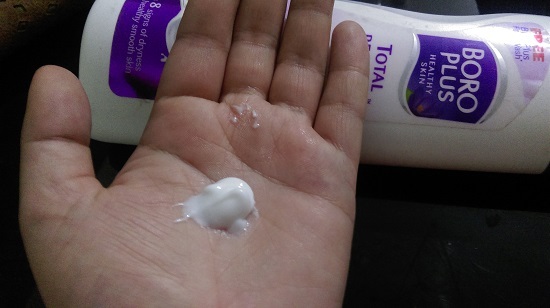 The Boro plus Total Results Moisturizing Lotion comes in a white colored plastic bottle. The bottle is sealed on top with a purple colored flip cover that helps you avoid spillage. The bottle is travel friendly and sturdy. The lotion is white in color and amazing in fragrance. I love the way it smells. It is not too thick in consistency which makes it easy to apply.